← Welcome to the New Look of Our Blog! Accuracy is nothing more than repeatability. In order to discover the level of accuracy of your weapon you will need to be able to replicate shots. One of the most difficult parts of making highly accurate shots is the ability to remove human error – or the small vibrations and wobbles that can occur before, during and after a rifle is fired. 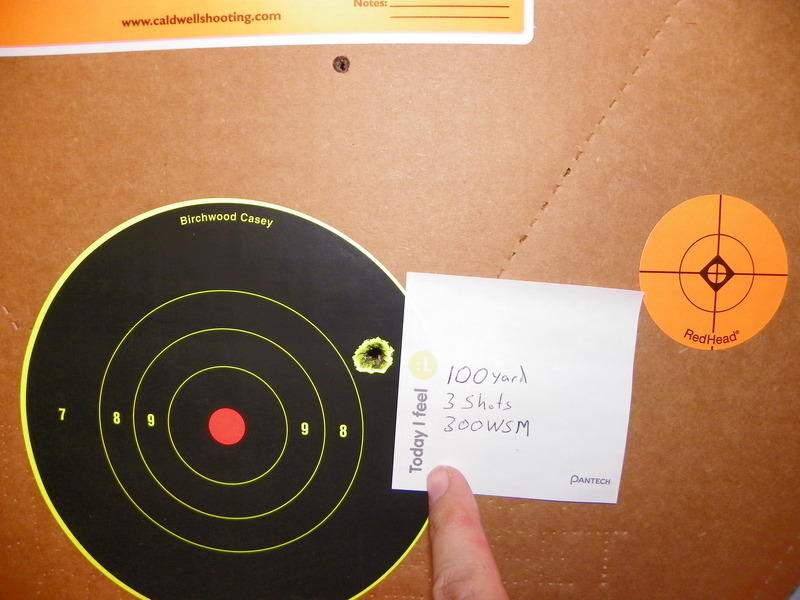 Who wants movement at 100 yards when you are testing load development or zeroing a scope? The Hyskore Black Gun Machine Rest is a valuable aid. Hyskore products have always been built with the serious shooter in mind and this product is no exception. Why should you have the best rest possible? A bad rest won’t let you put the cross hairs on a dot and get them to stay there as you pull the trigger. The more stable your rifle is while dialing it in – the better. The last thing you want is your rifle jumping around when you are looking for real accuracy. I know some people think it is hard to beat front and rear shooting bags, but to evaluate new loads and for sighting in purposes, you need the gun to stay as steady as possible. Sandbags can drag or dip which can cause a change in bullet impact. A cheap light weight rifle rest is no better since it will jump. The Hyskore Black Gun Machine Rest with a recoiling system will help in developing not only accuracy but ideal sight pictures and confidence. Using the rest is an excellent way to observe the shooting process by watching sight lift, the slide operation and the gun coming back into battery on the target. There are even drills from the NRA that help improve your skills. Before going into the field with your gun it is a huge advantage to know what your firearm can shoot. 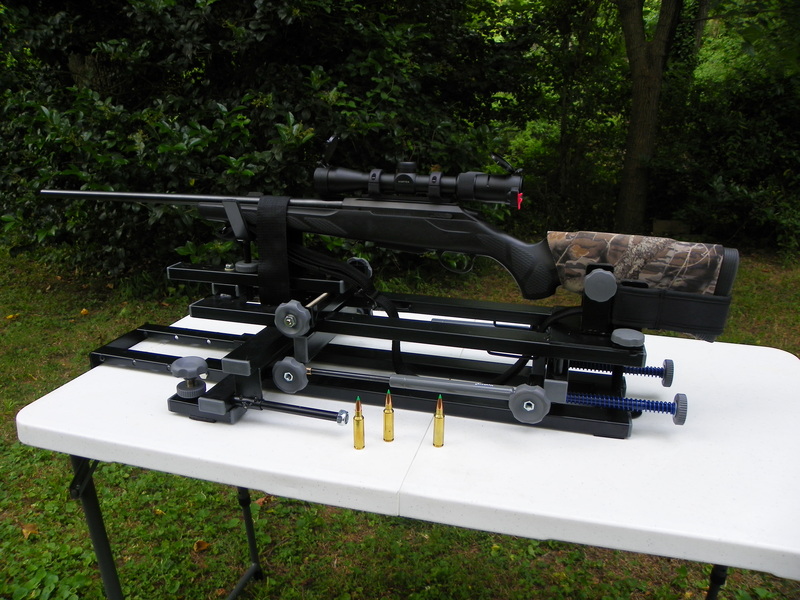 The rest will allow you to properly test the ammunition, scope mount, rings and the scope itself. With the Hyskore Black Gun Machine Rest I was able to get tight groups consistently under a 1.0 to 1.5 MOA and even exceptional groups of less than 1.0 MOA (see photos below) at 100 yards and 200 yards. Now let’s talk specifics about the Hyskore Black Gun Machine Rest. It has a dual rail design made to accommodate guns with pistol grips and high-capacity magazines. Almost any type of gun from a .22 long rifle to a .375 H&H Magnum can be used with the rest. 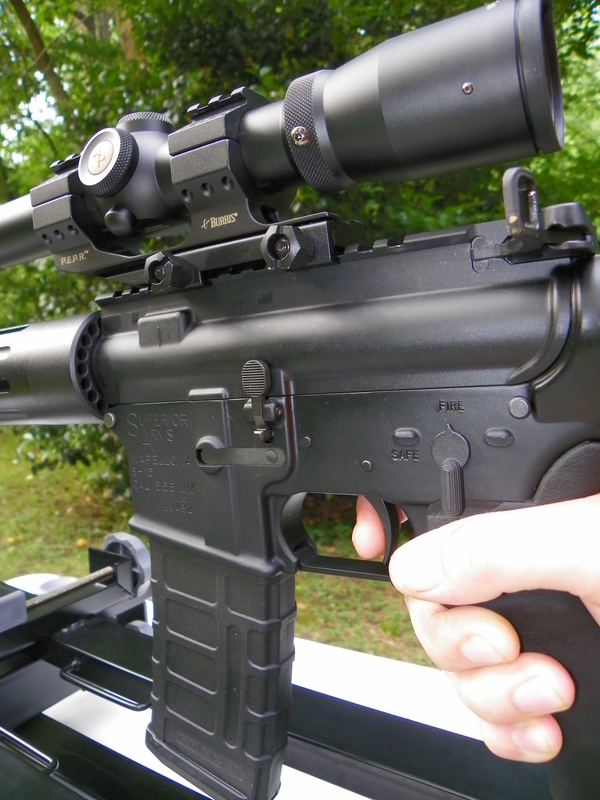 I was impressed with the recoil system which can even be adjusted to fit personal preference. In the photos you will note there are five threaded holes for support attachments so the rest can accommodate guns of varying length. Velcro straps are supplied to anchor guns in place to allow for testing of repeatability and load evaluation. To get the best test results you should anchor to a bench if possible as a rest with a recoiling system is even more effective if it can be mounted stationary. 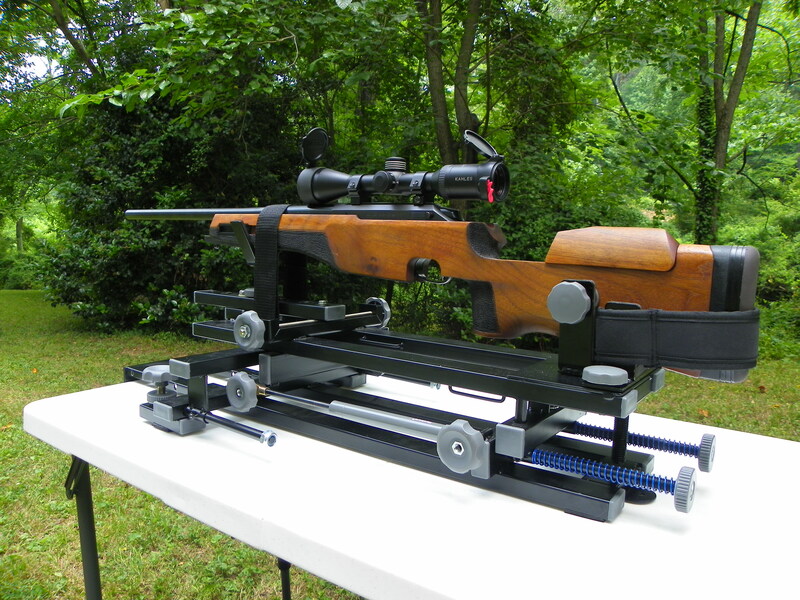 I was impressed that the manufacturer included complete instructions in the owner’s manual for building a generic bench as well as information regarding center fire and rim fire accuracy and how to calculate recoil. Another impressive component is a remote hydraulic trigger release. The water filled syringe is another part of removing human error from the equation. Ever wonder if it is you and trigger control or your scope? Think your reticle is moving around inside your mount? Do you need to work on mastering taking your shots between the heartbeats? You will find the Hyskore Black Gun Machine Rest a valuable training tool. 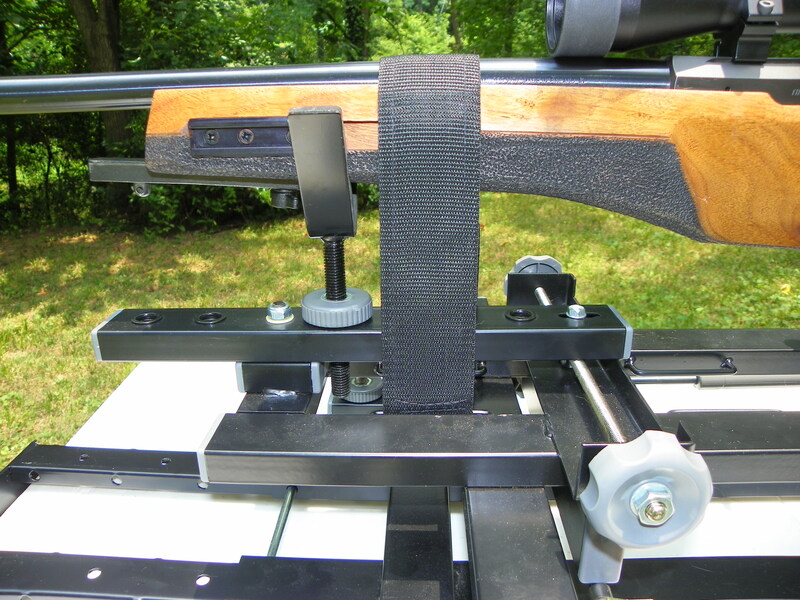 I used the Hyskore Black Gun Machine Rest to work on load development at my home range, South River Gun Club. 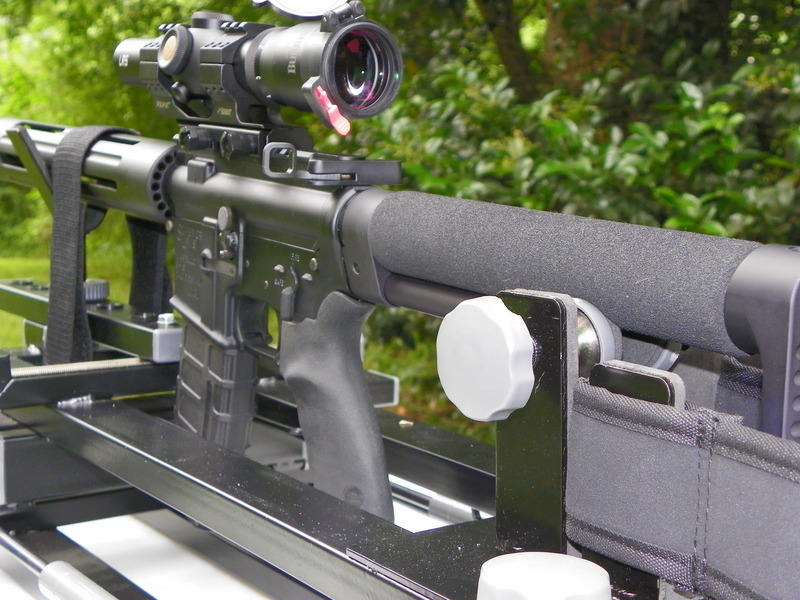 The rest allowed me to develop the optimum load for my rifle and the hydraulic trigger system allowed me to pay attention to the details and make small adjustments. While you may find cheaper rests, they will be of inferior quality. This rest is worth the money and the craftsman ship is top quality. Using the Hyskore Black Gun Machine Rest is taking my rifle skills to the next level and my load development continues to improve. If you are in the market for a new rest, look no further. Hyskore is dialed in for quality and accuracy. You will be shooting picture perfect groups at 100 yards in no time at all. To check out even more photos of the Hyskore Black Gun Machine Rest, check out Carducci Tactical’s Facebook webpage. Different guns and lots of close up shots. Check out all the action! Be sure to “like” Carducci Tactical and all the information we have to offer. 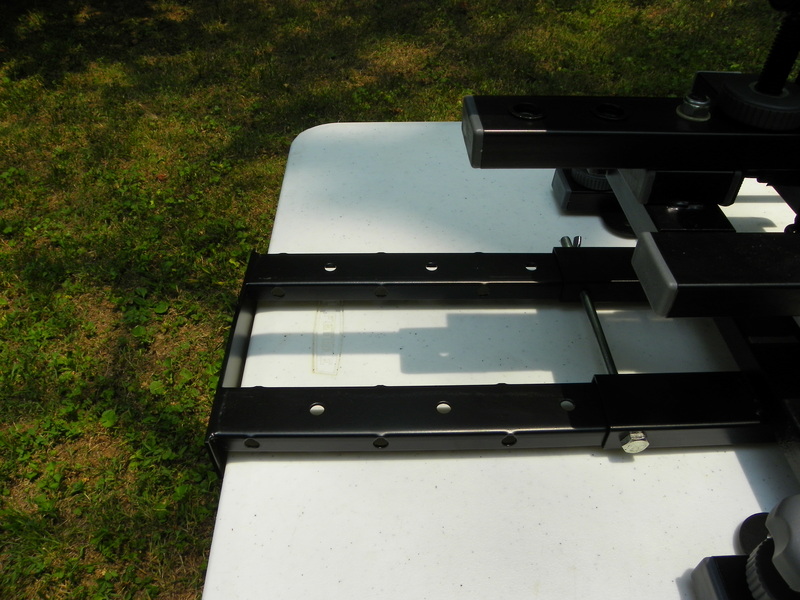 Next up – Hyskore’s Portable Armorer’s Vise. We’ve got a lock on all the information you need. Doesn’t seem overly bright, putting a strap across your barrel. Causes a change in harmonics that wouldn’t be there while shooting the gun off the rest. Good idea, if you can’t hold your own rifle, but bad design. I got very good results with the rest. I only review products that I would recommend. We don’t get paid or compensated for our reviews. I’ve tried others and this is my favorite. I will let you know if I see any improved products for 2012.